In Ottawa, people are saying it's the summer that sun forgot. In Manitoba, Winnipeggers can crow about an almost perfect summer. In British Columbia, fires have dominated discussion while fog, ice and decent weather for a change has people gabbing in Atlantic Canada. With records being broken across the country, how can Canadians not be talking about the weather? Environment Canada climatologist Dave Phillips says the weather patterns in Canada this summer have been anything but ordinary. The extreme conditions, so different for so many compared to last summer, are part of a new reality he says is becoming increasingly hard to ignore. 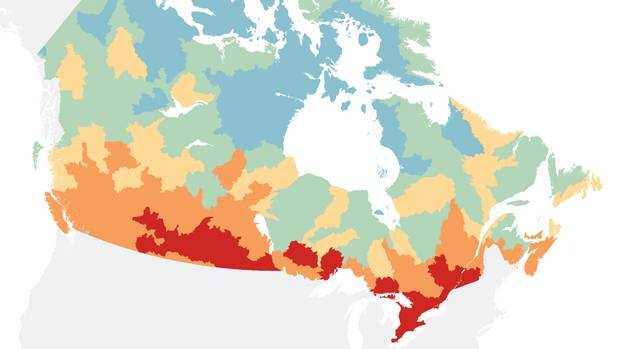 From record rains and swollen lakes in central Canada, to scorching heat and a parched land in the Prairies and western regions, Mr. Phillips says what is happening this summer is indicative of the effects of climate change that Canadians should now expect. This summer, it's being further influenced by a hung and static jet stream sitting high in the Arctic and over the Great Lakes. "When you see more wild swings, more see-sawing, when you go from droughts to floods [without] something in between, that to me is the mark of climate change, something we're seeing now, " he said. The focus in British Columbia has been the raging forest-fire situation this summer. To date, the BC Wildfire Service says 490,000 hectares of earth has been scorched, an area three-quarters the size of Prince Edward Island, which makes 2017 already the third-worst forest-fire season in the province's history. The worst was in the late 1950s, when more than 800,000 hectares burned. So what role has this year's weather played in creating this disaster? Mr. Phillips says heavy rain this spring that flooded rivers and yards from the Okanagan and Lower Mainland then northward led to a burst of growth for grasses. Combine that with the lush vegetation with the scorching, dry, windy and lightning situation that the region experienced in early summer. 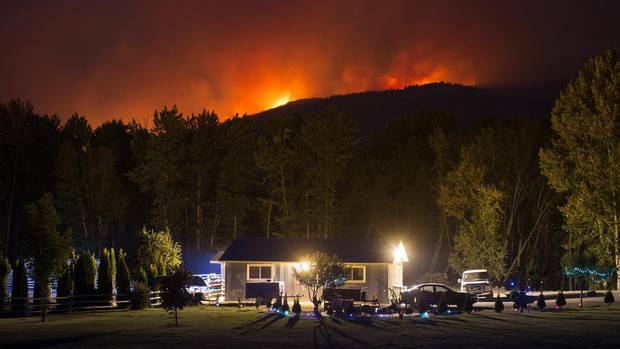 Emergency Info BC started issuing evacuation orders at the beginning of July and it was near this time the weather set the stage for the perfect conditions to accelerate the fast-moving fires that are still roaring across parts of the province. "It was that one day, I believe it was Friday [July 7] where you had that lightning, lots of dry lands and winds on top of it," Mr. Phillips said. "At first, it was just a few fires and then all hell broke loose and it became a real disaster." Mr. Phillips added further caution, saying August is normally the driest month for B.C. and that since summer started, just 3.4 millimetres of rain fell in the Kamloops region (the average is 45.1 mm). There have also been more than 30 days on which the thermometer peaked at, or over, 30 degrees. The worst of the heat, though, has been in Alberta and Saskatchewan. In Medicine Hat, 22 days in July were hotter than 30 degrees. Across the border in Regina and Moose Jaw, both southern Saskatchewan cities are contending with record dryness. In Moose Jaw, it has been the driest July on record since the 1930s, with just 4.3 mm of rain falling. Regina picked up just 1.8 mm of rain in July and recorded the hottest day in 28 years on Sunday, with a temperature of 38 degrees. While it's dry in southern Saskatchewan, the northern half of the province has been soaked. La Ronge and Meadow Lake received about 210 mm of rain during the same time that the capital was cracking from lack of precipitation. A year earlier, La Ronge and area only recorded about 70 mm of rain in July, a third of what they received this year. And while half of Saskatchewan is soaked and the other half parched, its neighbour Manitoba is in line to claim perhaps the best Canadian summer of 2017. In both June and July, the average temperature was about 23 degrees with nearly 50 days of sunshine. For better or for worse, blame the jet stream, Mr. Phillips says. "Saskatchewan has been like Canada, too wet and too dry. It comes down to the jet stream, the river of air that controls the flow of air and delivers weather systems," Mr. Phillips said. 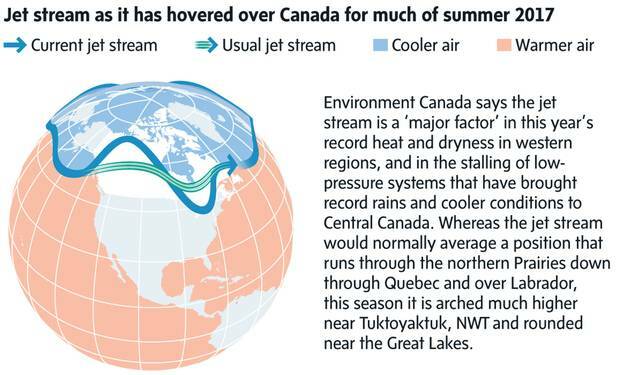 "Typically it hangs out in the northern Prairies, the North West Territories north of Hudson Bay, but this year the jet stream is hanging out further north in the west and farther south in the east," he added. Such northerly and southerly arcs in the jet stream has meant an area of high pressure over western Canada, while parking low-pressure systems over parts of Ontario and Quebec. "That low was like a traffic jam of storms, they would come in and rain on Parliament Hill and move away and another would come in and another," he said. "It was almost as if what we were seeing is too much weather in the east and not enough in the west. We like balance, and we didn't get the balance and it led to the extremes." A number of factors including heavy winter snow and spring runoff made for the perfect primer to fill the Great Lakes to record levels this season, flooding campsites, eroding shorelines and changing summer plans on both sides of the border. Lake Ontario reached a level of 75.88 metres above sea level on May 29, an all-time high. According to Mr. Phillips, a stalled jet stream over southern Ontario meant even more rain to overwhelm an already swollen Lake Ontario. It also led to a series of weather systems bringing more grey skies, precipitation and cooler temperatures to Toronto this summer compared to last. From June 20 to July 31, Toronto hit 30 degrees just seven times, compared with 24 days in 2016. By the end of July, 386 mm of rain had fallen over the CN Tower this summer, compared to 133 mm during the same period in 2016. "Last year, people in Eastern Canada were convinced that climate change had arrived because of the intensity of summer. What climate modellers had said would arrive in 2050 or 2060 seemed to arrive in 2016. People were thinking 'wow it arrived earlier,' and then, this year, they are asking 'whatever happened to climate change or global warming?" Mr. Phillips said, adding that the extreme swings from year to year are exactly the hallmark Canadians should consider as an indicator of climate change. In Ottawa, summer has been described as a "soaker." Last month was the second wettest ever in records dating back to the 1800s, with 249.8 mm of rain (the record of 250.2 mm was set in 1899). From April to the end of July, 704.2 mm of rain drenched Canada's capital, more precipitation in four months than normally falls in a year, Mr. Philips said, adding that the Ottawa region saw just 57 mm of rain in July of last year. Heavy rain and high river levels in early May led to some 4,000 homes and business in southern Quebec being flooded, with several areas declaring states of emergency. By the end of July, Montreal had received 540.8 mm of rain, and not a single day above 30 degrees. "Still," Mr. Phillips said, "Montreal or Toronto can't hold a candle to the kind of bummer summer seen in Ottawa." For New Brunswick, especially Saint John, the spectacle has been fog. Environment Canada recorded 27 days of fog or mist so far this summer, with 159 hours of thick fog recorded from June 17 to the end of July. On Prince Edward Island, a dry June and July may be setting the stage for an even drier August. Summerside recorded 69 mm of rain in June, about two-thirds what normally falls. By the end of July, less than half of the average 74 mm had fallen. That said, across the Northumberland Strait, parts of Nova Scotia have been drenched in rain. Sydney, on Cape Breton Island, recorded 255.3 mm of rain in May, making it the wettest start to a summer since about 1870. 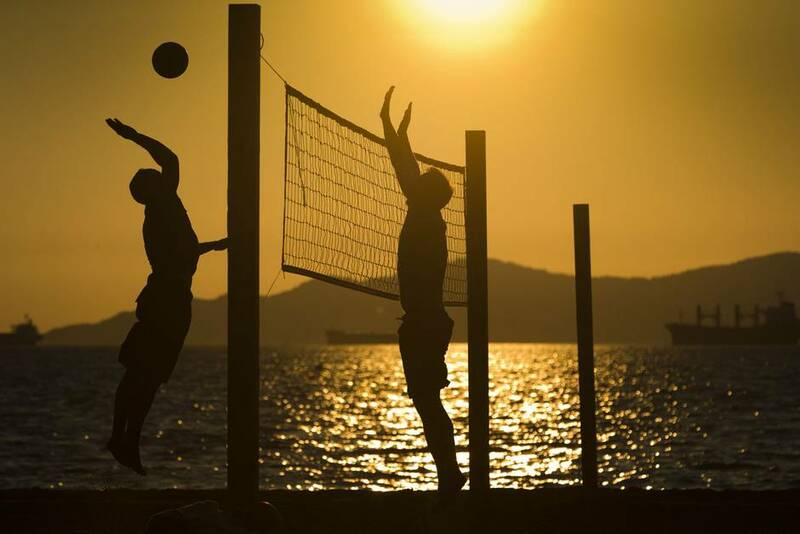 Parts of Newfoundland and Labrador are enjoying a mild, mostly sunny summer, which is welcomed by residents who usually count on being smothered in fog and take summer one day at a time so as to not be too disappointed if a cold, rainy season sets in. "You know Newfoundland is having a good summer when residents in St. John's are actually happy to see rain on a weekend to help with their yards and flowers," Mr. Phillips said. Despite the variability in the provinces, the average temperatures in Canada's northern three territorial capitals actually haven't varied much for the month of July over the past 40 years. Take, for instance, Iqaluit. According to Environment Canada, the average temperature in July was 11.6 degrees, compared with 9.8 in 2007; 12.4 in 1997; 12.0 in 1987; and 11.7 in 1977. Further east on Baffin Island, areas around Clyde River actually picked up a few centimetres of snow in the first half of July. Mr. Phillips says summer snow also fell in James Bay, on the shores of northern Ontario and Quebec, as well as in parts of northern Labrador. And while summer snow isn't out of the realm of possibility for some northern regions, it still comes as a surprise to people in the areas where it happens. In Whitehorse, the average temperature for July was 19.4 degrees, compared with an average temperature of 21.5 in 2007; 21.1 in 1997; 21.3 in 1987; and 19.6 in 1977. And in Yellowknife, the average July temperature was 26.1, compared with 22.9 in 2007; 22.6 in 1997; 20.3 in 1987; and 21.2 in 1977. With this mind, during the first week of August, Whitehorse and Yellowknife looked and felt more like a summer in Toronto. Residents in the the capitals of Yukon and the Northwest Territories basked in a week of straight sun and daytime highs that hit 25. As for what to expect the rest of summer, Mr. Phillips says much the same. According to Environment Canada, all three territories as well as the area over Hudson Bay and Baffin Island have a 60 per cent to 100 per cent chance of being warmer than normal for the rest of August and into September. A warmer than normal August is also expected for PEI, Nova Scotia and Newfoundland, as well as the Prairies and British Columbia. A cooler-than-average second half of summer is in the forecast for parts of Labrador, while southern Quebec and Ontario can expect August to keep being damp. "Taking a look at what's coming in August," Mr. Phillips said. 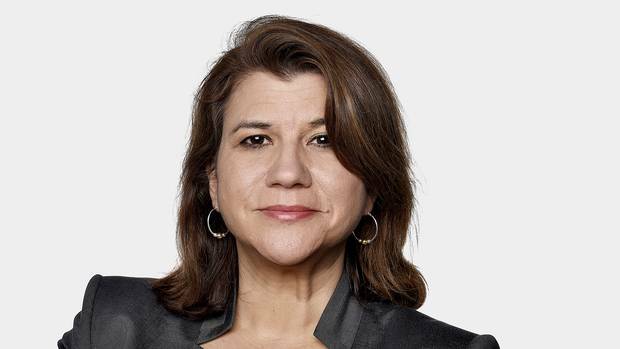 "It is more of what we call 'weather persistence,' what you see is what you are going to get." Charting Canada’s troubled waters: Where the danger lies for watersheds nationwide A comprehensive review of Canada’s freshwater ecosystems reveals rising threats to our waters from climate change, pollution, invasive species and other problems, Ivan Semeniuk reports. Will western wildfires get too intense to fight? New research suggests climate change will dramatically hamper our ability to stop future fires from destroying communities, Mike Hager explains.